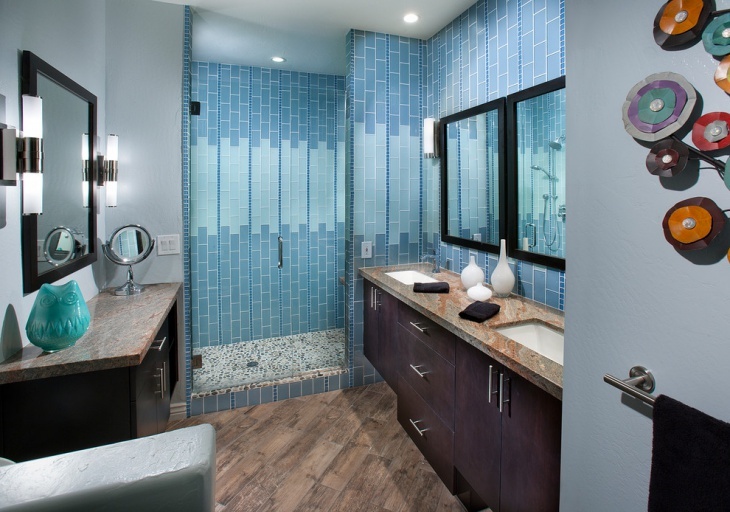 A blue bathroom tile design looks cool, reflects the peaceful tranquility of water and is a natural fit in bathrooms. 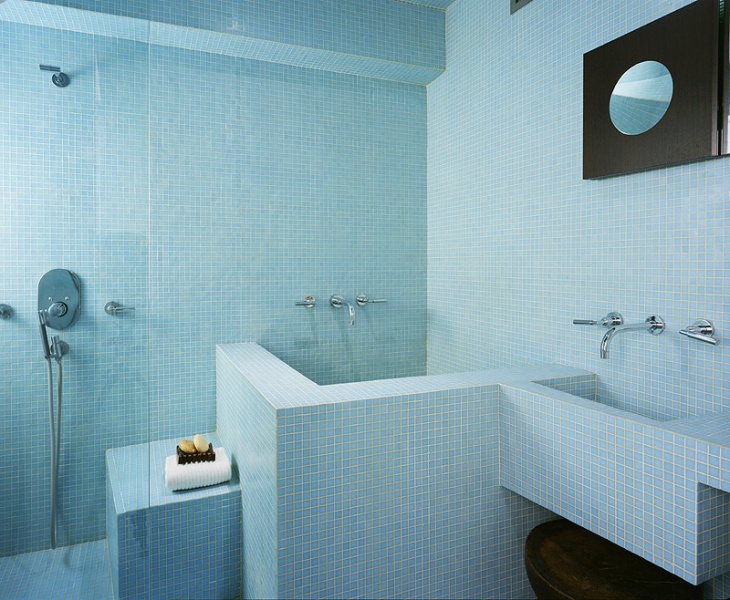 Blue is a cool, clear and refreshing color and when incorporated in the bathroom tiles, it makes for a vibrant theme! 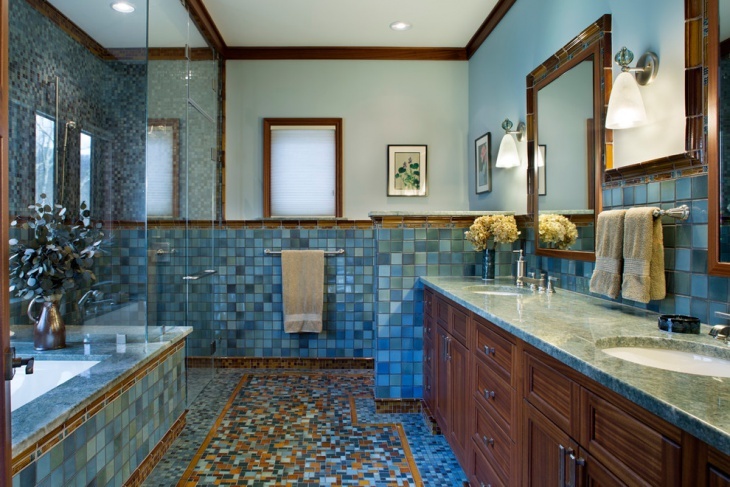 Here are a few breathtaking blue bathroom tile designs for you to consider while designing or renovating your bathroom. 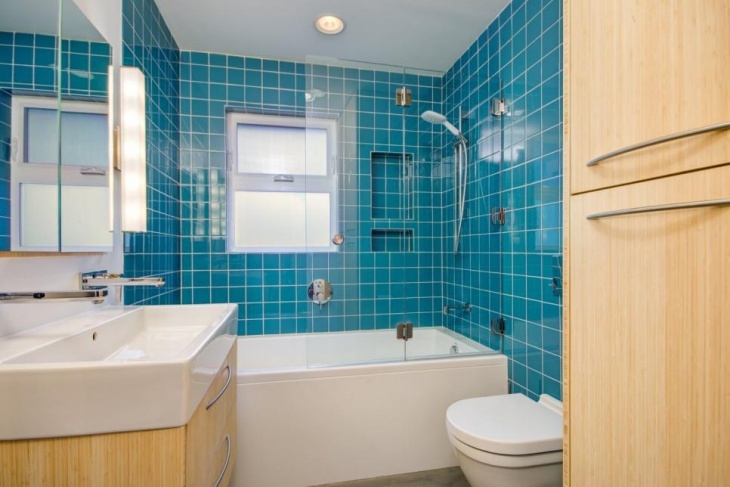 This modern bathroom has very bright teal tile backsplash with a small window to allow in some natural light. 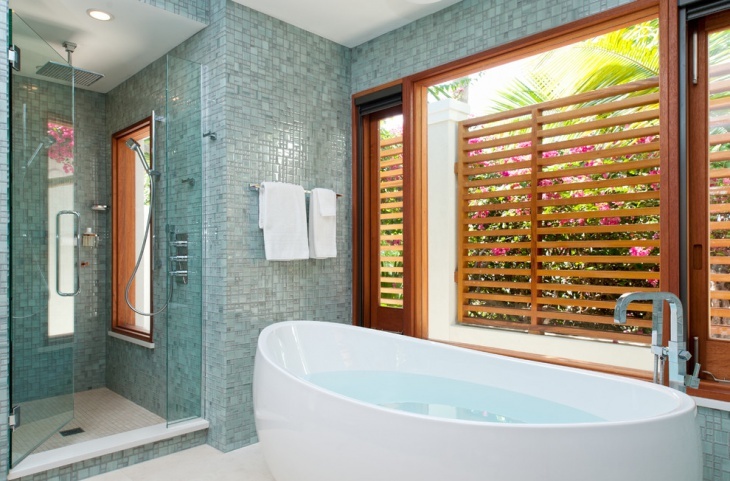 It also features a luxurious glass enclosed shower and a large rectangle sink with a wooden vanity right below to store all the bathroom essentials. 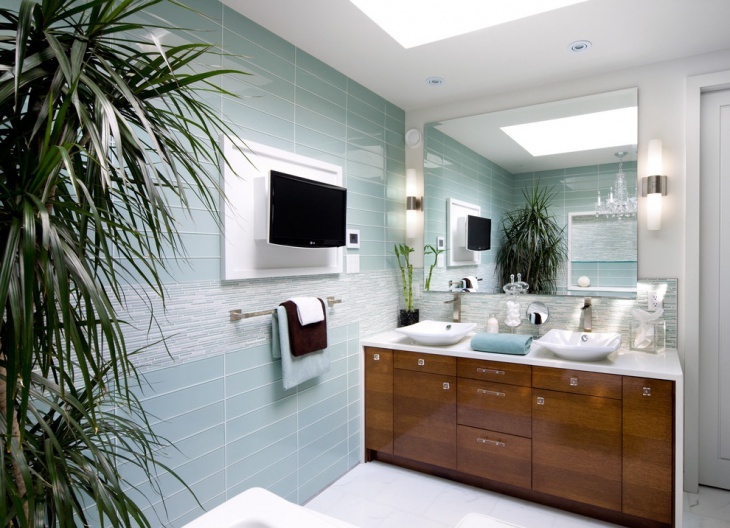 This elegant contemporary bathroom has very light blue colored tiles fitted in the walls, features a small LCD TV screen and a large wooden vanity with several drawers. It has dual sinks and faucets alongside a large mirror with lights in the corner. A huge chandelier is also hung on top of this bathroom. 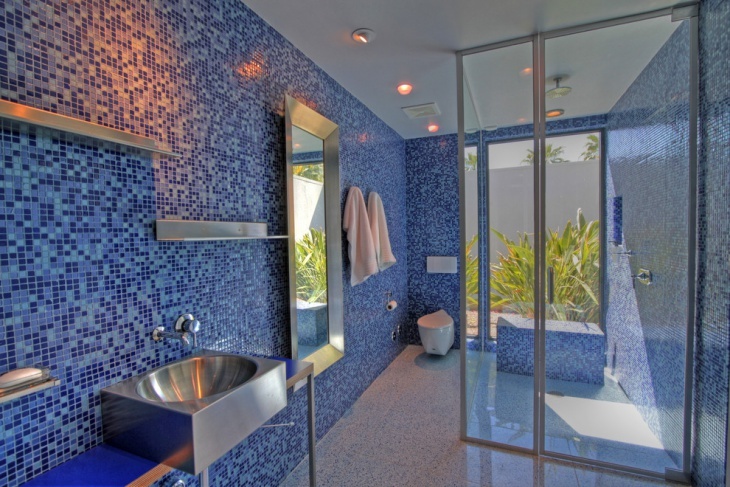 This true blue aquatic bathroom has checkered tiles in blue, green and turquoise which give the space an aquarium like look. 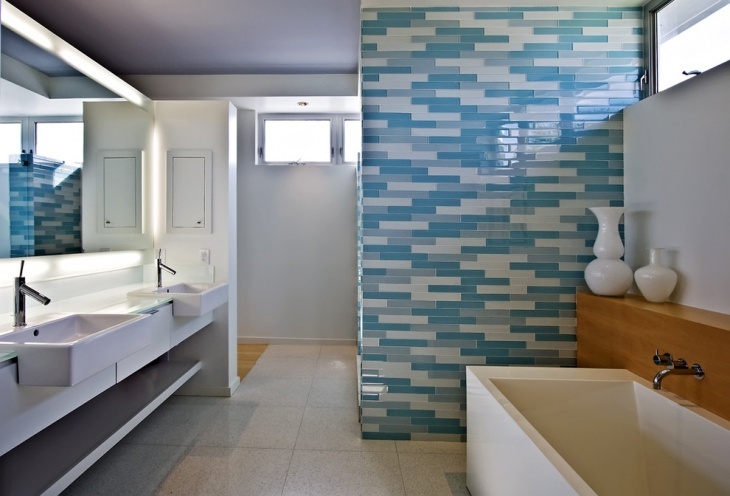 The floor and wall tiles mosaic in blue complement with each other very well. It features a rich wooden cabinet which is just beneath the two marble countertops and a small towel bar in the middle of the sinks along with two separate mirrors. 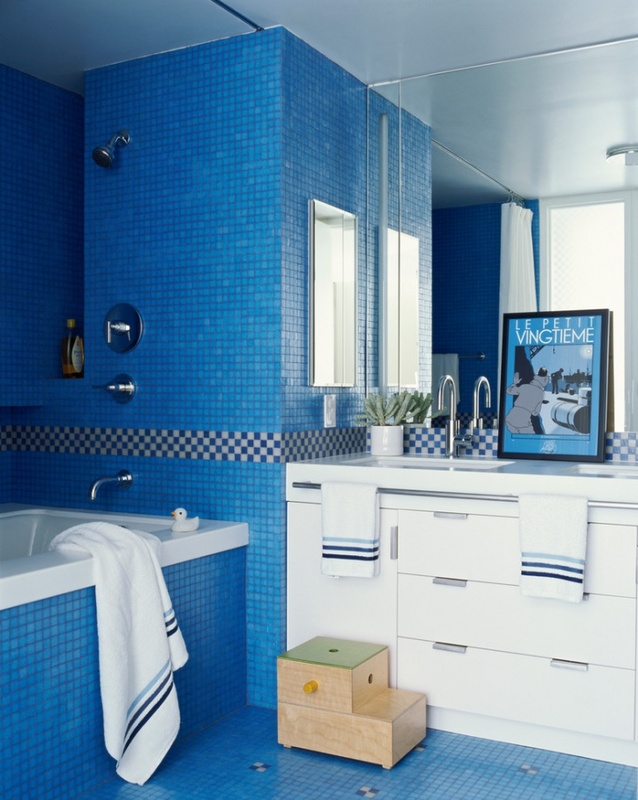 This bathroom features ocean blue wall tiles and mosaic tile flooring which create a very soothing ambiance. 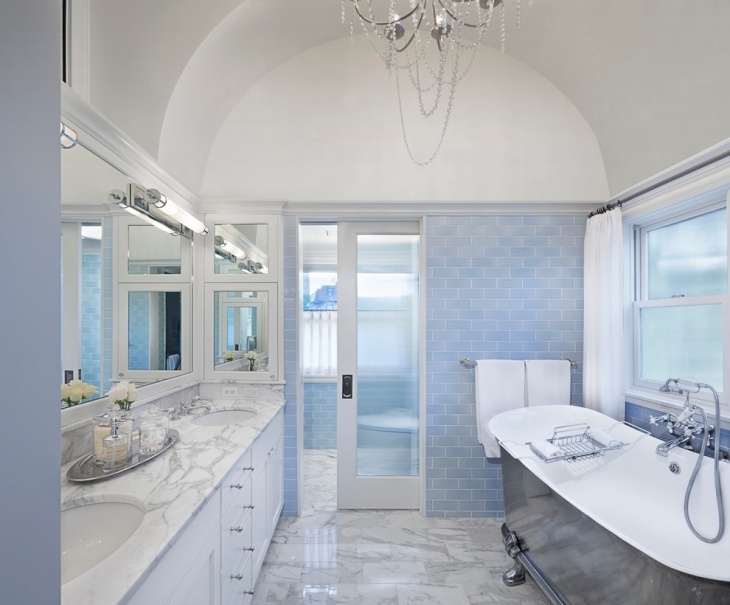 It has a huge countertop in white that sits atop a large closet, and features an oval shaped light fixture and a medium sized tub which also has an oval shape. 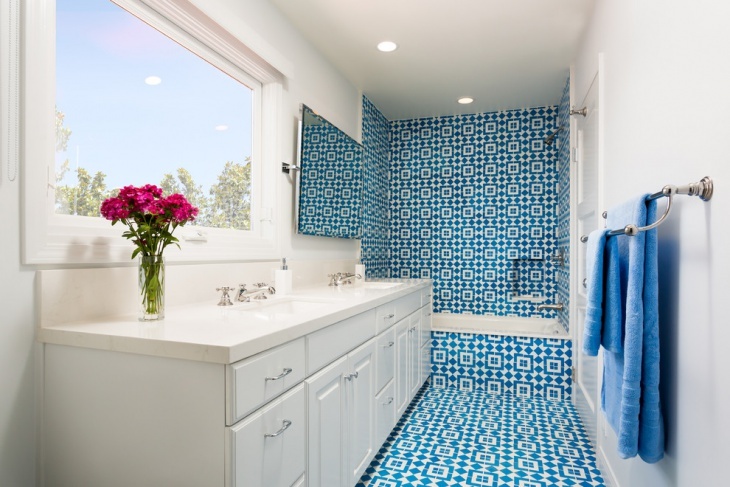 The wall and floor tiles are in patterned blue and go really well with the white interiors of this bathroom. It features a dual towel bar that is fitted in the white wall right opposite to the large cabinet and two under mount sinks and a large window just above. 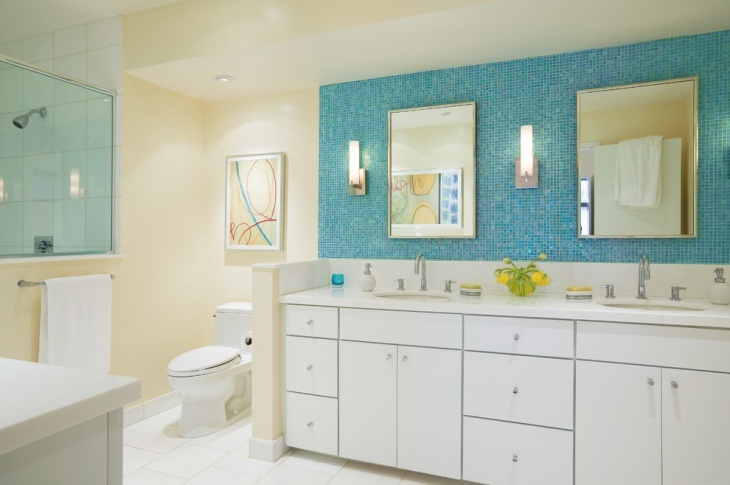 This patterned blue bathroom calls for a very serene atmosphere and is very tranquil. 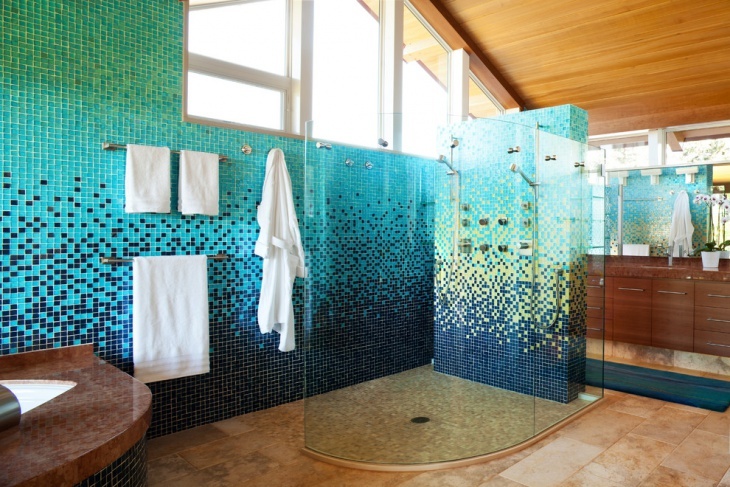 A very uniquely styled master bathroom, it has a custom glass shower and mosaic tile walls in cool blue, sage green and turquoise. 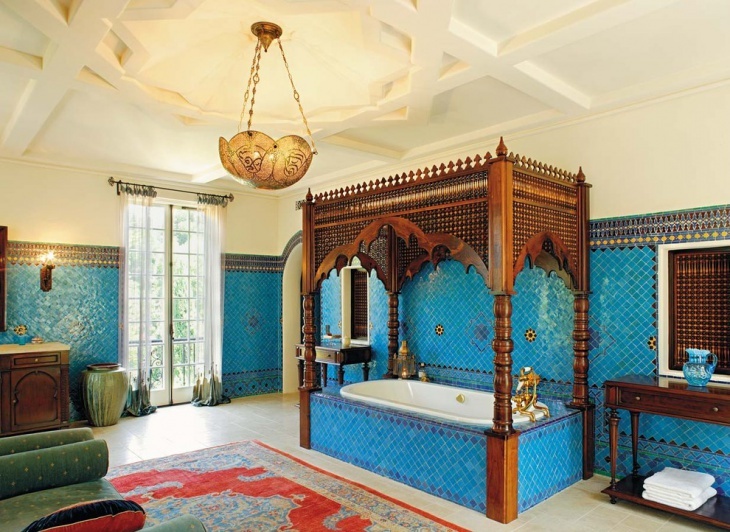 It is designed so that the husband and wife can have their own space while bathing, and at the same time spice up their romance in the middle. 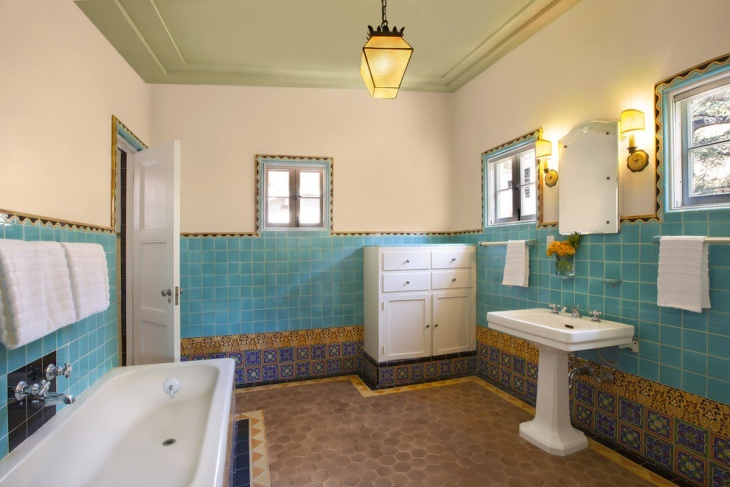 This bathroom has light turquoise blue checkered tiles on all sides of walls of the space, is very colorful and spacious. It is ideally designed for kids who love to splash waters on the walls and has a swimming pool feel to it. 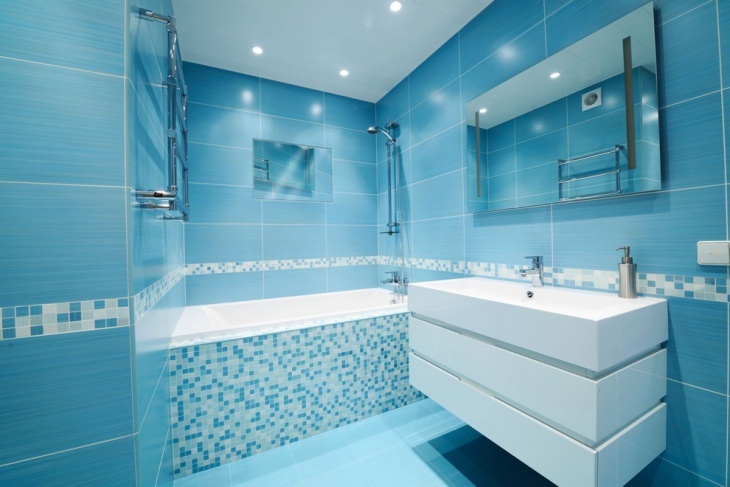 This blue bathroom features big wall tiles with horizontal mosaic tiles complement the wall very well. The floating cabinet in white is very elegant and has a glossy finish to it. 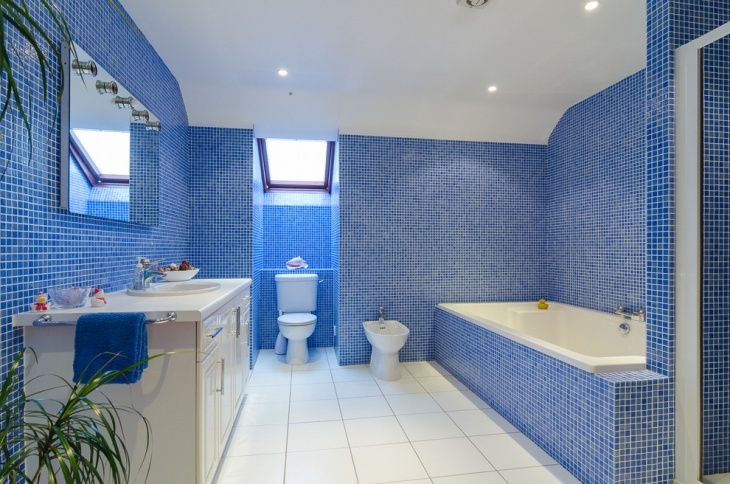 The lighting also goes very well with this awesome blue bathroom. 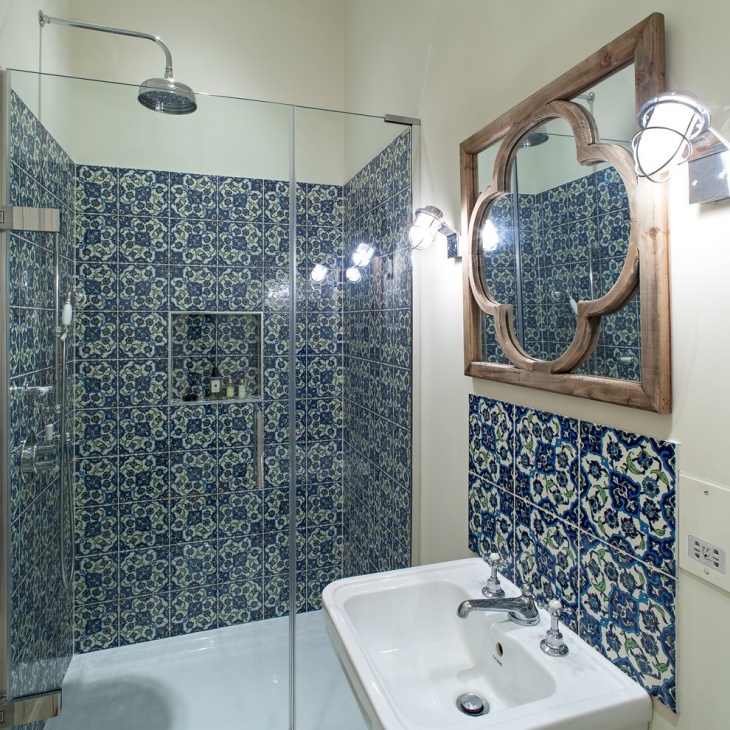 This is a traditional bathroom with dark blue floral tiles, a high shower and a mirror with brown frame in it. It has a glass partition in the middle and is a mix of contemporary and traditional. 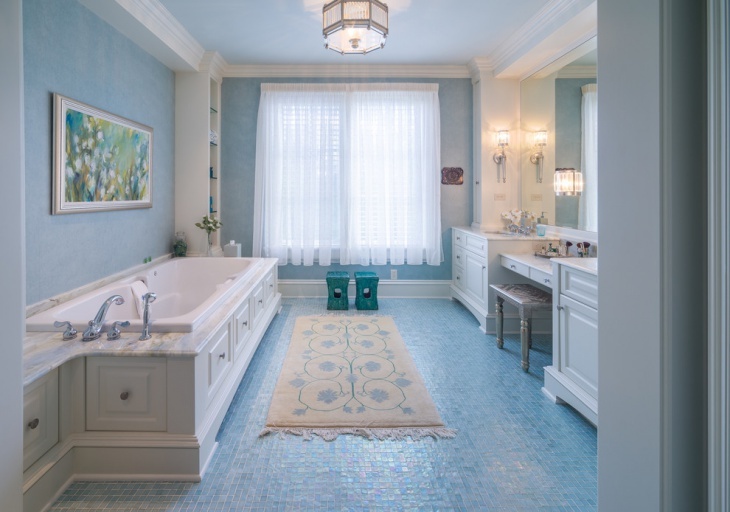 The dark blue mosaic tile wall and flooring are the same and goes well with the white cabinet and other décor of the bathroom such as the white curtains. It has small towel racks right in front of the sinks. 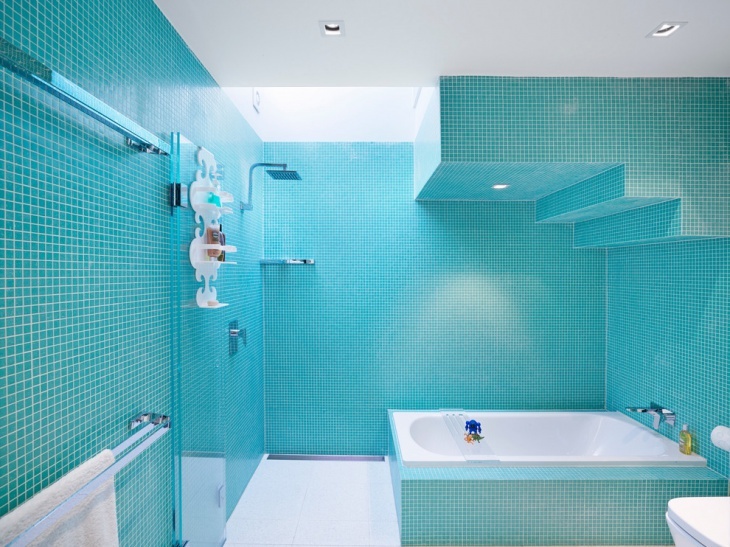 It is a very cool and striking contemporary bathroom, perfect for kids.